Most vegetables are annual plants that are grown from seed sown each year. If you don’t have time to raise your own plants, buy small ones from garden centres in early spring. Quick-maturing crops are the easiest to grow in pots. Look out especially for compact or dwarf varieties – which have often been developed with container gardening in mind. Look through seed packets in a garden centre or go online – a wider range is available via the internet. Two seed strains are developed, each with a desirable characteristic, such as disease resistance or size of plant. These are then crossed with each other to produce seeds that will inherit both characteristics alongside ‘hybrid vigour’. This is the ‘first generation’ – hence F1 hybrids. F1 hybrids always germinate readily and produce reliable crops. Although more expensive than ordinary seeds, they are worth the extra outlay. 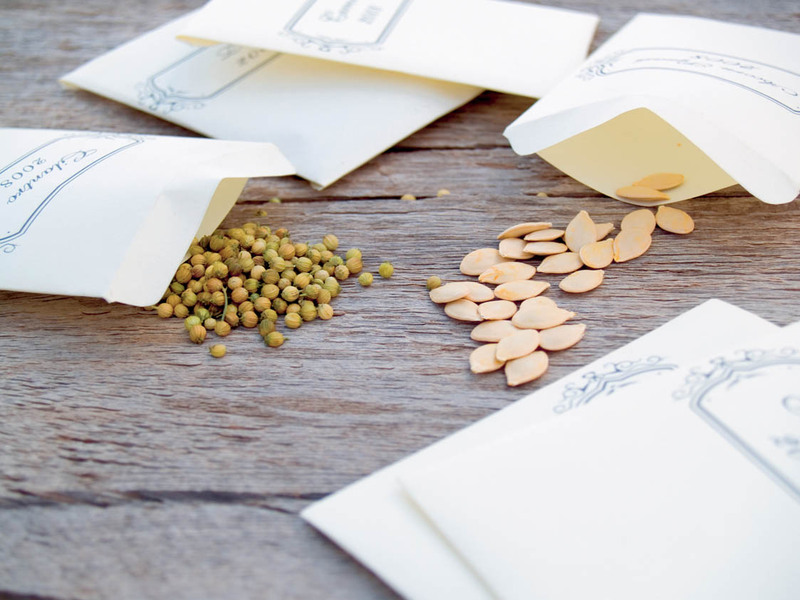 Seeds are normally packaged in small foil packets inside a larger paper packet (which generally has sowing instructions on the back). To prevent having a glut of a particular crop, make successive sowings over a period of weeks. After cutting open the foil packet, sow only the amount needed for the first crop. Fold over the cut end, then store this (in the outer packet, for identification) in the salad compartment of the refrigerator. Note: Most seed should be sown as soon as possible, however. If stored for a long period (more than six months), germination will not be so good. Always sow seed as thinly as you can. Crowded seedlings will not be so vigorous and may not grow evenly. Compost: Fill pots, trays or modules with seed or multi-purpose compost. Water: Lightly firm the compost surface down to level, water (from a watering can fitted with a fine rose, so as not to compact the compost surface) and then allow to drain. Seed: Sow the seed thinly and evenly across the compost surface. Cover with the appropriate depth of compost (or sharp sand). Seed is always sown to its own depth. In other words, if a seed is 20 mm (1 in) in diameter, cover it with 20 mm (1 in) of compost. Very fine seed should just be pressed into the compost surface and then topped with a light sprinkling of compost (it can be easier to use fine sand). Flat seed should be laid flat or, if large enough to handle, pressed into the compost on its edge. Put the seeds in a light position, but out of direct sunlight. The correct temperature – as indicated on the seed packet – is important. An even temperature, without steep fluctuations, is usually preferred. Spray the compost surface with water every few days so it does not dry out. 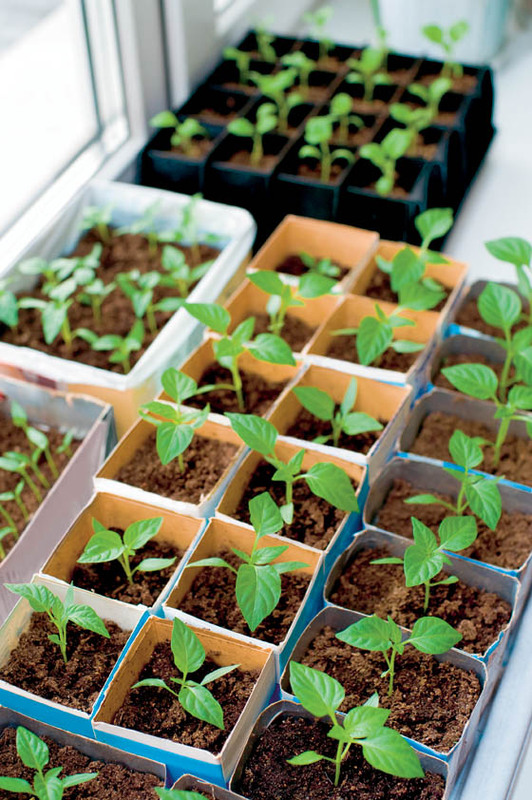 After germination, turn the container daily, as the seedlings tend to stretch towards the light. If you need to thin seedlings, rather than discarding them, add them raw to salads. When the seedlings produce their second set of leaves, remove them carefully from the compost. Hold them by the leaves, and use a dibber, pencil or the handle of a teaspoon to lift the roots. Pot them up into trays or pots filled with soil-based or multi-purpose compost, allowing more space between them. Water them frequently from now on and feed with a seaweed extract. Pot them on again when they are sturdy and well developed. Note: If you sowed seed individually in modules, seedlings can stay in the modules until the roots fill them. The seedlings should then be large enough to go outdoors. 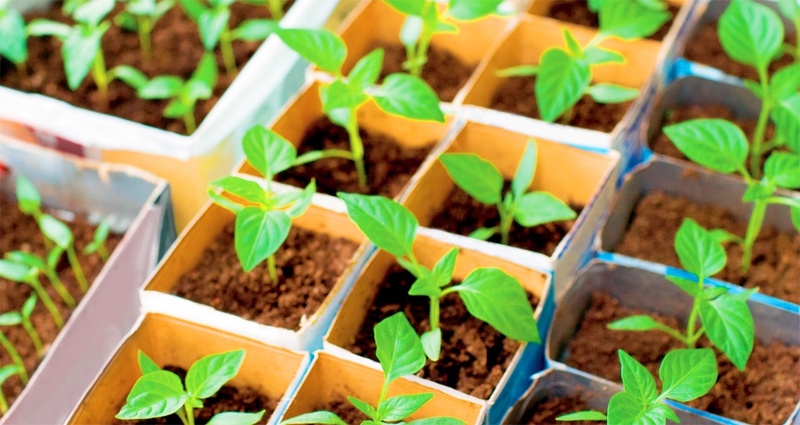 If you raised the seedlings indoors, you will have to acclimatize them to life outside gradually. Stand them outside for increasingly longer periods each day. Be sure to bring them indoors overnight, when it will be colder, particularly if frost is forecast. Hardening off should take about two to three weeks. Containers: Choose large containers, ideally at least 25 cm (10 in) deep. The compost is less likely to dry out in these. Compost: Good-quality compost gives the best results. For preference, use a soil-based compost (John Innes No.2 or No.3). If you use a multi-purpose type, add grit or sharp sand or perlite or vermiculite to improve drainage. Vegetables in multi-purpose compost will need more frequent feeding. Watering and feeding: Vegetables in pots should be kept well watered at all times. Uneven watering will lead to poor development (and a loss of flavour and texture). Feed vegetables regularly with an organic seaweed extract (or similar product). Most root vegetables are slow-growing, so are unsuitable for containers. 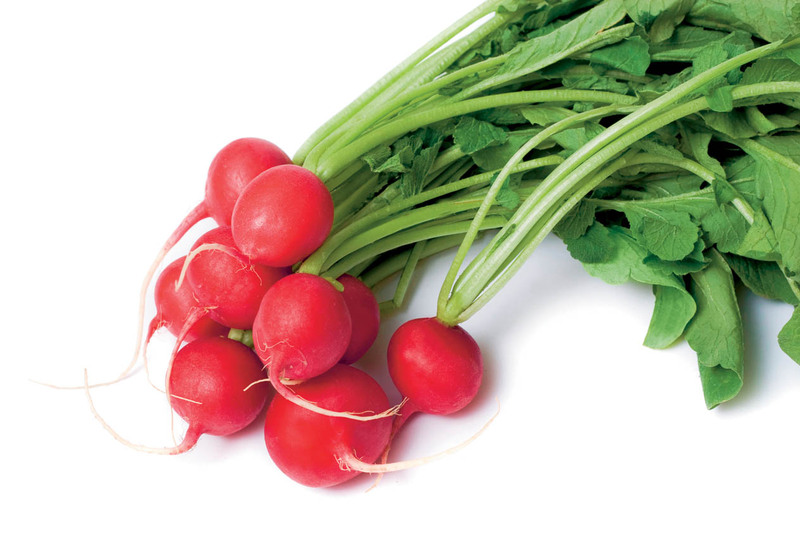 However, you will get excellent results from radishes and beetroot. You can make successive sowings to be sure of crops over a long period. Alternatively, beetroot can be harvested when they are the size of golf balls (replace them with a fresh sowing) or you can allow them to grow on to the size of tennis balls. Both are fast-maturing crops, and can be grown in the spaces between other crops (such as lettuces) before these grow too big and crowd them out. Leafy salad crops include all types of lettuce, chard, spinach and rocket. Some of these are very decorative (especially types with red and/or frilly leaves) and can even be used in window boxes and other large containers that are used mainly for flowering plants, especially if you choose cut-and-come-again varieties. These are leafy vegetables – including spinach, rocket and some lettuces – that will produce fresh leaves over a long period. Rather than harvesting the whole plant (as is usual), simply remove the leaves you need for immediate use (cutting near the base). Plants will resprout to produce further leaves for cutting. These are narrow plastic bags of compost that are intended to be used as they are for growing particular vegetables – usually tomatoes and other salad crops. They are laid flat on the ground and holes are cut in them for the plants. Though convenient to use, they are not things of beauty. They can be concealed with wicker or wooden boxes to improve their appearance – or laid behind small pots of herbs. 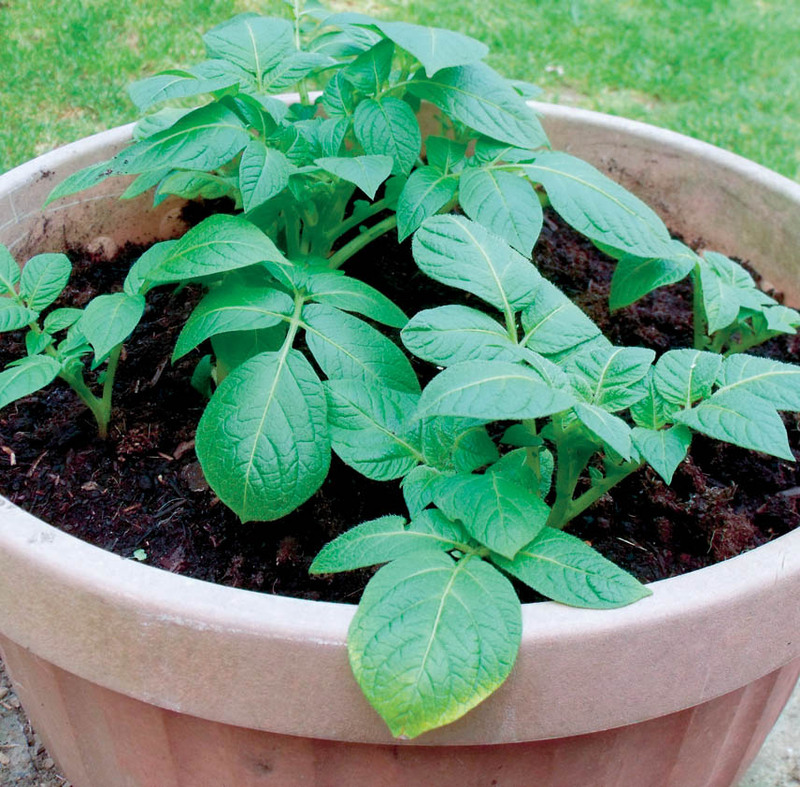 Perhaps surprisingly, new potatoes are easy to grow in containers, reliably yielding excellent crops. The manner of growing them is quite unique, however. Unlike most other vegetable crops, potatoes are not grown from seed but from special tubers, known (confusingly) as seed potatoes. Note: Potatoes are not hardy. In cold areas, the stems and leaves should be sheltered from hard frosts. To prevent them from collapsing, lay a length of horticultural fleece over the container on nights when frost is forecast. Potatoes need a large deep container. This should preferably be black, as the maximum of light should be excluded, or the tubers may turn green. A black dustbin or compost bin is ideal. Drill holes in the base before use. You can buy special tall containers, specifically for growing potatoes. Some are made of polyethylene or other similar durable fabric and can be folded away after the crop has been harvested for further use next year. They sometimes have a door or flap low down on one side, which you can open in order to harvest the potatoes. Note: The principle behind container growing for potatoes is to keep raising the level of the compost as the potato plants grow. Drainage: Fill the base of the container with a layer of crocks, up to 10 cm (4 in) deep, to cover (but not block) the drainage holes. Compost: Add a 15 cm (6 in) layer of compost. Tubers: Lay five (or more, depending on the size of the container) seed potatoes on the compost surface. Any shoots on the tubers should point upwards. 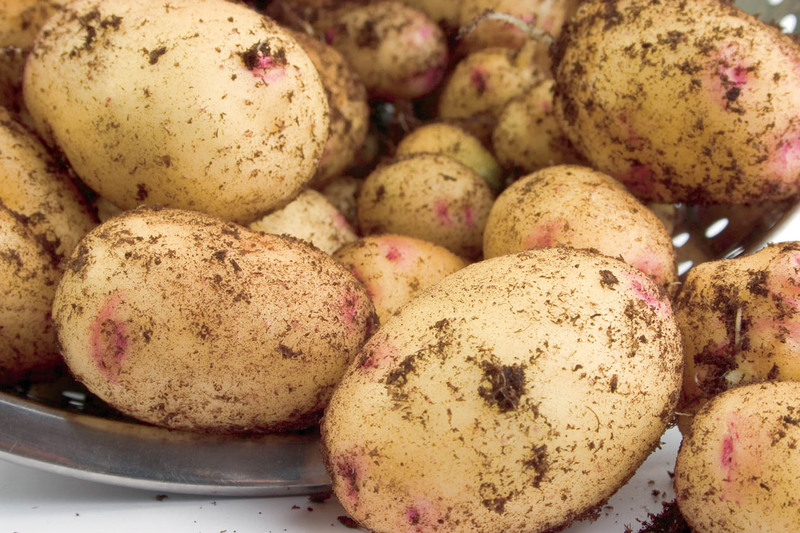 Cover the potatoes with a layer of compost so that they are just covered. Water in: Water the compost well. Leaves: When the leaves have grown above the compost surface, add more compost to cover them. Cover: Keep covering the stems with compost as they grow, until they reach the top of the container. Harvest the potatoes just before the plants come into flower. If there is no door or flap in the side, empty out the container and excavate the potatoes from the compost. 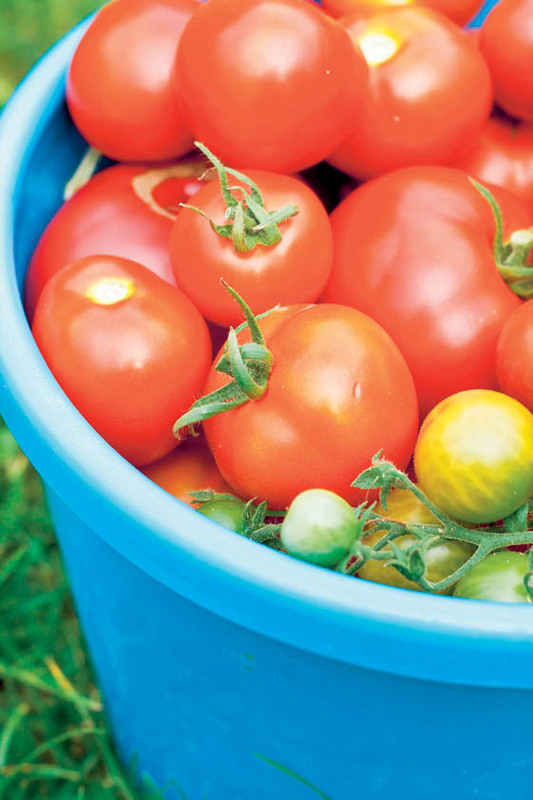 Because they are so susceptible to disease, tomatoes are nearly always grown in containers, even by gardeners who have dedicated vegetable gardens or allotments. Use individual pots about 25 cm (10 in) in diameter or grow the plants in growing bags. Technically, tomatoes are fruits, as are aubergines, sweet peppers and chilli peppers. But as they are almost invariably used in savoury dishes, they are often treated as vegetables. Tomatoes are tender plants that do not tolerate frosts. In cold climates, some varieties are suitable for growing outdoors – once all danger of frost has passed – while others should only be grown in a conservatory or greenhouse. Indoor types can be sown in late winter to early spring for early crops. Delay sowing outdoor types till mid spring. By the time the seedlings are well developed, all danger of frost should have passed, and they can be safely placed outside. There is a wide range of fruit size, as detailed below. While most plants produce red fruits, there are also white, orange, yellow and striped varieties. Globe or slicing tomatoes: These are the type most usually seen, with rounded fruits about 3 cm (1½ in) in diameter. 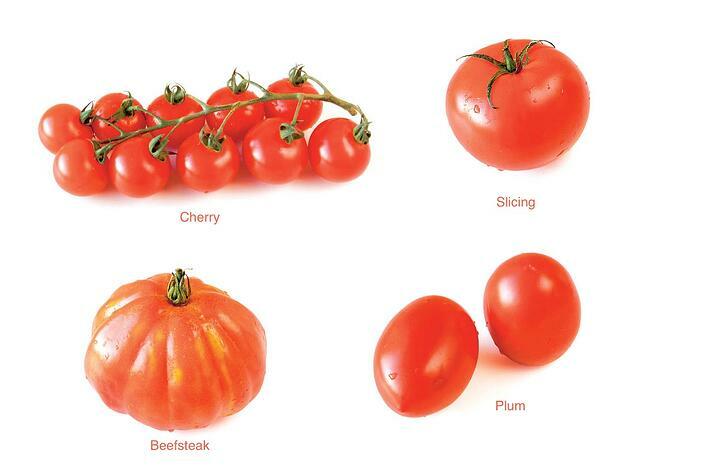 Beefsteak tomatoes: These are much bigger, often ribbed, and wider than they are high. Plum tomatoes: These tomatoes are elongated and often pointed at the tip. Cherry tomatoes: These are small and round, like marbles. Grape tomatoes: Similar to plum tomatoes, but much smaller. Grafting has only recently been applied to tomatoes. Grafted plants are more vigorous than seed-raised ones and produce earlier and bigger crops, with fruiting beginning lower down the stems. They also show greater disease resistance than seed-raised plants. Order plants from a seed merchant or buy them from a garden centre in spring. Tomatoes need a temperature of around 20°C (68°F) to germinate. Sow them in trays or small pots. When the seedlings are large enough to handle, pot them up individually into 7.5 cm (3 in) pots and into 12.5 cm (5 in) pots a few weeks later. When they produce their first flowers, they can go into large pots or growing bags. Insert a thin cane or bamboo next to each plant for support. the canes as they grow. After the plant has produced four clusters of flowers, pinch out the tip of the main shoot. Note: Bush varieties do not need to be trained. 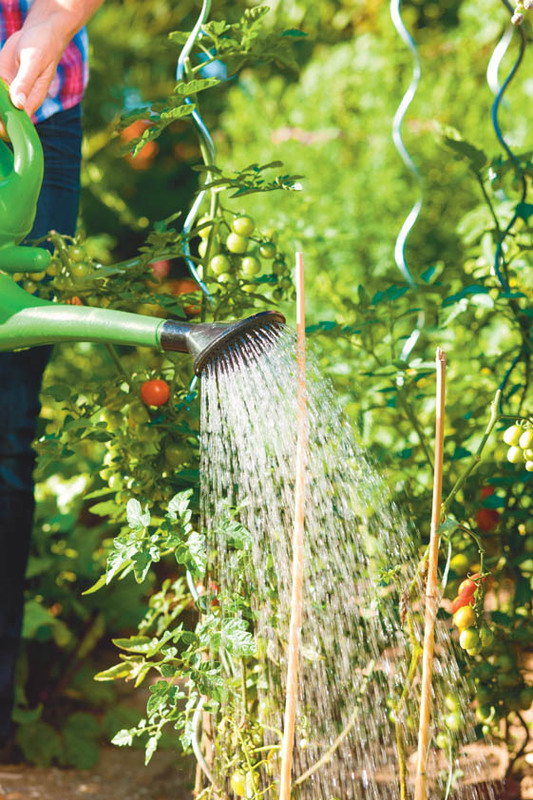 Keep tomato plants well watered at all times. 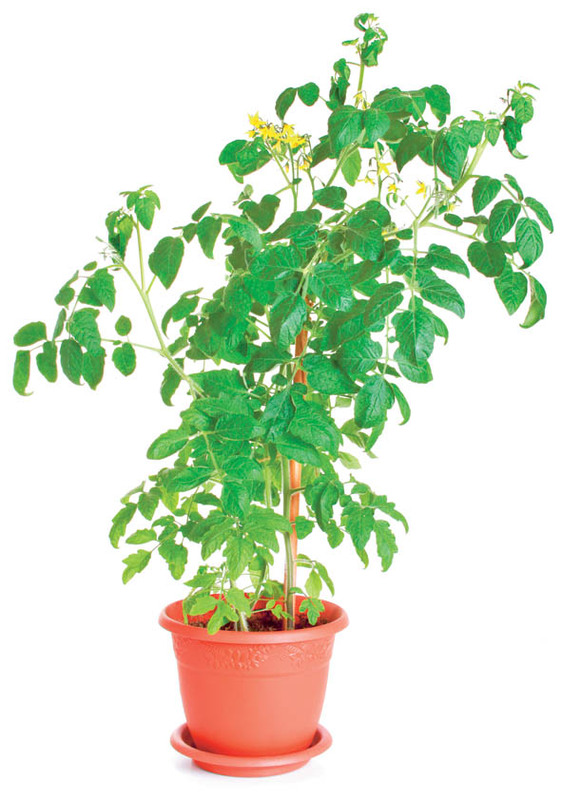 Feed the plants regularly with a tomato fertilizer to ensure good fruiting. When in flower, water the plants by spraying over them. This distributes the pollen, ensuring good fruiting. 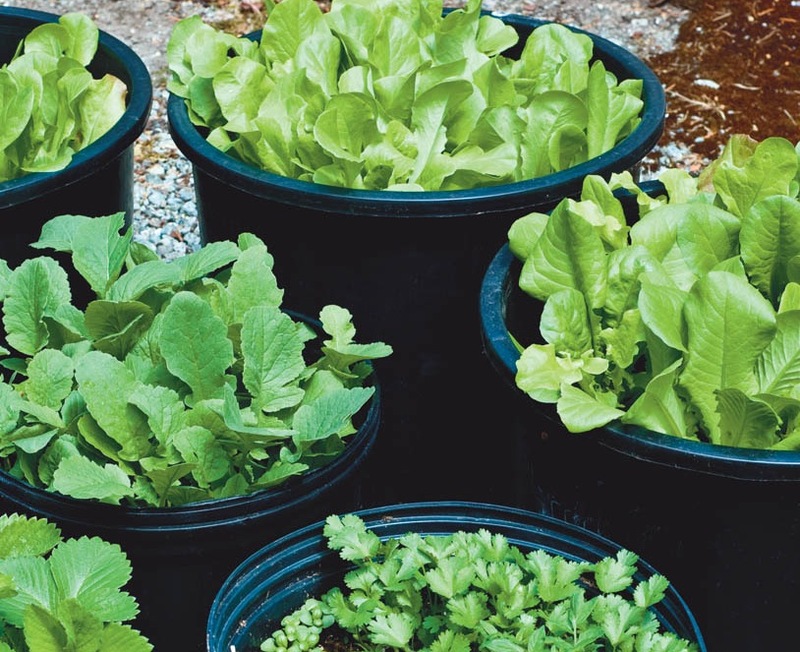 This post is based on an extract from our fantastic book, Container Gardening by Andrew Mikolajski (ISBN: 9781783611348) – where you can find further info on growing food in containers. Check out our book, Container Gardening, for more on container gardening in general. Here are some more suggestions for great crops for containers. Some words of wisdom from 'Vertical Veg' man, Mark Ridsdill, on container gardening: choosing the perfect pot for your crops.